Just to tell it at the beginning: It was a pefect weekend and a wonderful meeting. As it is one of the first events of the year, I was realy looking forward to the "All Indians Weekend" in Trebic, Cech Republic. Because the meeting was very good last year, I hoped for more or less the same this year. To get the most out of the weekend, we left vienna on friday noon. After two hours of driving we finished our 100mls trip to Trebic. 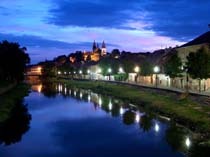 After checking in at the hotel we wanted to see the sights of the city, like the jewish quarter and the old monastery. As we returned to the hotel, more riders had arrived at the hotels parkinglot. There were trailers, motorcycles were unloaded and small maintinance was done at the cycles. A little later our Dutch friends with Hans van Heesch arrived at the hotel after 700mls roadtravel. A special Price should be given to Hans Allers for the coolest trailer-car combination. He pulled his motorcycle trailer with his black, well tuned Jaguar S-Type. What a look!!! The evening ended early, because most of the people were tired `cause of the travel and wanted to start the next day in a fresh mood. After breakfast I went to the parkinglot of the nearby hotel where our motorcycles were parked, well guarded by security staff, over the night. More riders had arrived and space got shorter and shorter every minute. Motorcycle to motorcycle they were parked close to each other. One Powerplus with Sidecar from Hungary, the Prince of Jan, some Scouts before 1928, some 101´s, two 741 (one military, one civilian), Chiefs from all years and 3 Fourcylinder. Also some Harleys. 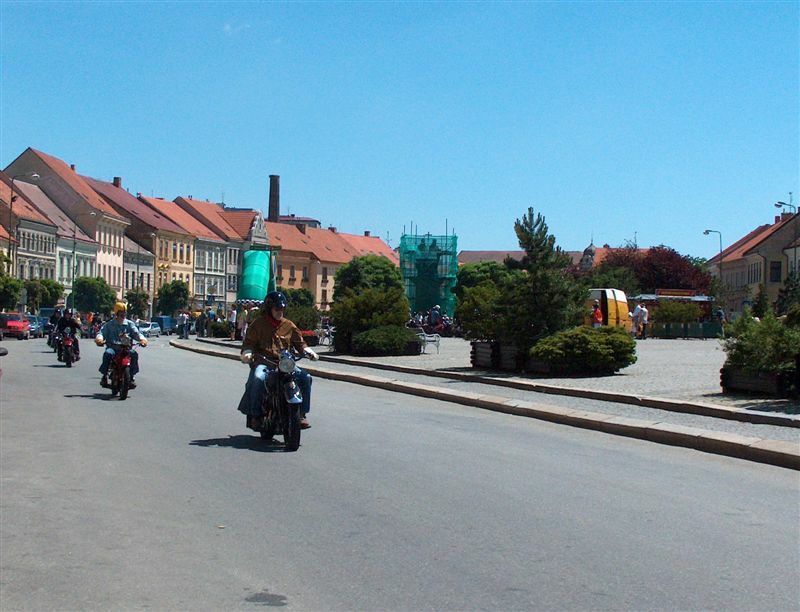 As all paticipants had arrived, the cycles moved to the mainsquare of Trebic. Many people had a look on the Motorcycles and there was a vote for the "most beautiful Indian" of the event. After the signalshot of the Indian-canon, Jan Peštál opened the road for the riders. After a few miles we left the modern and loud world. Little roads thru cornfields and sleepy villages were ridden by us. Most of the time there was no other traffic than us, so we had the perfect conditions for a wonderful ride. Also the weather made us smiling. Not to hot, but always sunny with little clouds. There was also a very spectacular "ride" this afternoon. 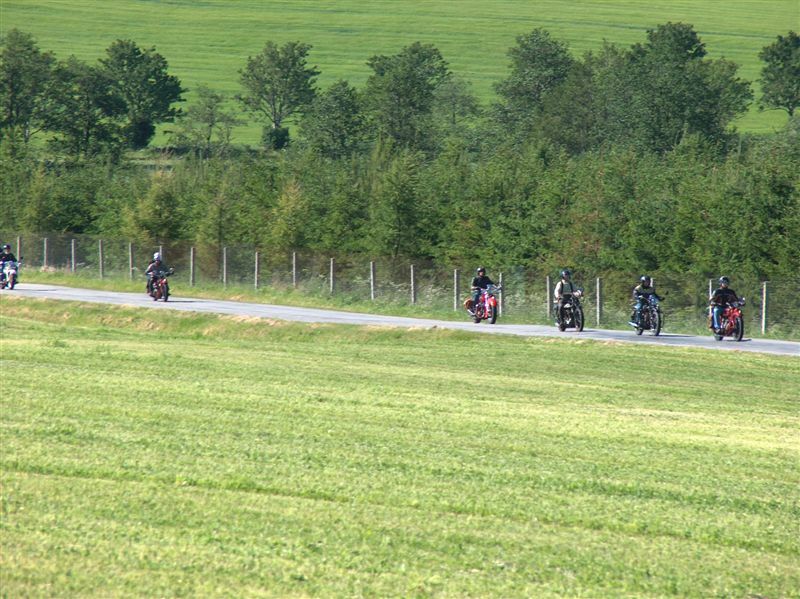 At a sharp turn, wich was in an uphill section, one rider choose the inner circle of the curve and had not enoght speed. With to much gas he lost control over his Indian Four and the motorcycle ran straight up a three meter high wall and the engine didn´t stop...!!! A second later the Four fell back on the road. The good part: Nothing serious happend to the rider. After the biggest shock had gone, we continued our ride. After dinner a liveband played, prices were given to the riders in different categories and as it got later, everyone danced and had lot´s of fun. Thanks to Jan Peštál and all the people who helped to make this weekend so wonderful. The organization was perfect, there were thoughts on everything. In the night the motorcycles were covered to protect them of rain, a professional security firm took care of the parkinglot. When we arrived at the meadow near the castle, everyone recieved a piece of wood to get the indian standing well in the high grass. The unbeatable low price of just 55 Euros for the whole weekend, including 2 overnights with breakfast, 2 dinners, lifemusic and a video af the "All Indians Weekend 2004" is just one more argument to visit the meeting next year. Once again, thank you very much! We have made 157 photos of this event, but there is not enoght space on this site to show them all. For 5 Euros, a CD with all the pictures can be ordered. Just send a short E-Mail.